Windy conditions continued for the start of Sunday races at the U.S. Open of Cyclocross across Valmont Bike Park, Colorado. It would be the second full day of UCI Category 2 with USA Cycling’s Professional Cyclocross Calendar (ProCX) points on the line for Junior 17-18 Men, Under-23 Men, Elite Women and Elite Men. Benjamin Gomez Villafane (Top Club CycloCross). went two-for-two in the Junior 17-18 Men’s contest, out sprinting Henry Jones (Bend Endurance Academy) for the win. Scott Funston (Rad Racing NW) finished third with Tyler Clark (KMS Cycling Killington Mountain School) 4th. In the Category 2 Elite Women’s race, Courtenay Mcfadden (Pivot Cycles p/b DNA) pushed across the line as the winner in a three-rider sprint. 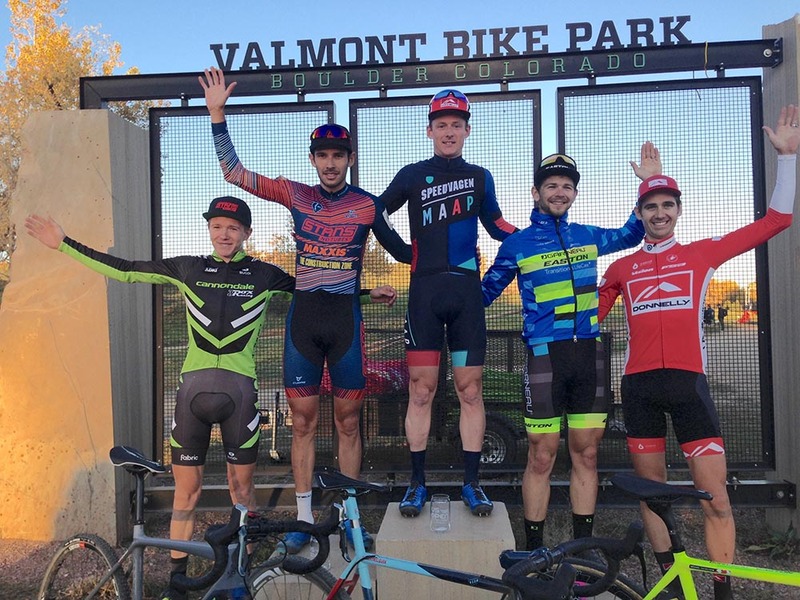 Rising star Katie Clouse (Alpha Bicycle Co.) grabbed the silver, with the bronze going to France's Caroline Mani (Van Dessel) Clouse and Mani switched positions on the podium on Sunday, as Clouse finished behind Mani the day before. It was the first UCI cyclocross win for ProCX points this year for Mcfadden, who came in to the weekend 15th overall in the elite women’s ProCX standings. The C2 Elite Men kicked up a dust cloud for their 8 laps on the dry course in Boulder, with Cody Kaiser (Lange Twins / Specialized) taking the hole shot. The field began to break apart midway through the race, with 23-year-old Keegan Swenson (Cannondale/3Rox) taking a turn at the front. The lead group also contained Canadian Michael van den Ham (Garneau Easton), Saturday’s silver medalist, Colombian Hector Riveros (Stan’s NoTubes), Australian Garry Millburn (Speedvagen X MAAP), and Americans Allen Krughoff (Krughoff Racing) and Jamie Driscoll (Donnelly Sports), who was Saturday’s winner. Three riders would make a move on the twisty course with two laps to go, and the move would stick for the final podium. It would be the Australian Millburn crossing the line for his first ProCX win this year in five events. Riveros would finish one-tenth of a second behind for second place, and van den Ham would roll across the line in third. Swenson finished fourth, and Driscoll managed fifth. 3 Caroline Mani (Fra) Van Dessel /Atom Composites s.t. 18 Ava Lilley (USA) Bend Endurance Academy s.t. 2 Hector Fernando Riveros Paez (Col) Stan's NoTubes p/b Maxx / Co at s.t.